Amsterdam is a city where culinary opportunities are rising faster than just about any city in Europe. The multi-cultural nature of the residents plus the fact visitors come from all over the world has resulted in Michelin star chefs painting culinary creations with a unique approach. And the product is meals and creations that expand the normal culinary boundaries. These five dining experiences are sure to provide an elegant and palate-pleasing evening. The concept of a speakeasy lives, where you book your table, check in on a street that resembles an alley, then are led to a table where cooking occurs in four stations around the open-concept restaurant. No drop-in dining here, you must book a reservation, then get an entry code for your dining time. You start in a posh bar, then sit at one of only six tables, which are placed around the open cooking stations. It has a private feel with a close-to-the-action view, and only takes 20 patrons per night. Dining options are 10, 15 or 20 courses for the evening. None will disappoint as embodied with creations that optimize visual appeal with a unique taste. The menu changes daily and seasonally with the Michelin-starred Gast using unique seasonal ingredients. Combinations include langoustines with orange dressing and gingerbread croutons, stingray with chicory, and venison with beets and light Dutch cheese are examples of what mysteriously and carefully appears at your table. If that wasn’t enough, unique wines are chosen each evening for each course. If you want an excellent French meal along the canal, a stop at this unique hotel, bar and restaurant combination. Start in the Library Bar which has 5,000+ books along the shelves, all authors who have stayed at the hotel and signed a copy for the living display. Contemplate literature with one of their signature craft cocktails in a literary atmosphere. Then head upstairs for a canal view while dining in an environment that when combined with the service, might just place you in Paris for classic French cuisine. The Scallops with barigoule cream and confit tomato are a can’t miss starter. Possibly the best way to see the canals and accompanying history of Amsterdam is a Stromma Dinner Cruise. Usually dinner cruises are hasty buffets, yet in this case, you get a four-course meal, served professionally as you meander the canals with all beverages. You can choose between options for the courses, such as the Salmon en papillote prepared with lemon and dill as the main course. During the 2.5-hour cruise, your meal and beverages are spaced correctly to make a memorable evening. The captain intersperses historical and cultural notes during the sail. The Silver Mirror is a Dutch house that dates to 1614. While you are under the original beams, walls, and stairs, the stage is set for fine Dutch cuisine including period-based china and silverware. The food is merely an incredible presentation to match the taste. You can’t go wrong with the fish of the day, prepared with spinach, green cabbage, smoked eel, lava, and Hollandaise sauce. Chef Yves van der Hoff goes to the same creative care with desserts such as the Stewed pear with chocolate mousse, curd, and Dutch treacle-waffles ice cream. In the city center, located adjacent to the NH Barbizon Hotel, the comfortable neo-modern Scandinavian décor is a clue that an excellent meal is in store. The four to six-course dinner menu changes seasonally and it carefully matched so each course flows to the next. The staff is keenly aware of your preferred pace, so expect to dine at the appropriate speed for your preferences. The food and ambiance have a spa-like feel where one course melts into the next. The roasted pear and pumpkin salad prime the taste buds for the monkfish with roasted seaweed with oyster sauce. Amsterdam has always been one of my favourite cities and it’s good to see it joining in with Europe’s culinary charge. To be honest I think we are lucky to be living in perhaps the greatest era of restaurant food that the world has ever seen. There are so many high quality chefs around nowadays. They are competing with each other and the bar keeps on being pushed higher. Yes, the culinary bar is really getting pushed upward and fast in Amsterdam. And, my experience is they understand both the art and science of fine dining. I always look out for a menu that changes daily adapting to what’s seasonal and available. Frequent changes also suggest a chef who is full of creative ideas. I’ll be looking out for the Speakeasy Graphite by Peter Gast next time I visit Amsterdam though I think I’ll be opting for the 10 course option – you can have too much of a good thing! Carolyn, the courses are not overly large, but rather artistically arranged. 15 courses is the perfect amount at Speakeasy Graphite. I grew up with the old-fashioned idea that you had starter, main and dessert – though where I came from it was usually called pud. If you were really lucky you got cheese and biscuits as well. What happens with 10, 15 or 20 courses? What are the courses called then? I’m guessing that you go through a sort of savoury to sweet progression. I’d also expect a few amuse-vouches along the way too. Well, actually, they don’t tell you what you are getting until it arrives, then they describe it. Yes, the arrivals bop around from sweet to savory, but at the whim and discretion of the Chef, Gast. It is all well thought out, you just sit back and digest. Appetizers, kind of, but more as a course to re-direct the taste buds for the next creation. I am not in the least bit surprised by the quality of the Stromma Dinner Cruise. I’ve found in a number of cities that dining on a river, lake or canal cruise makes a pleasant change from an evening in a restaurant. You get to see the local sights and also there are many local people on board too, often celebrating special occasions, so you get something of a feel for the local culture. I enjoy getting up for a stroll between courses and taking in the views out in the fresh air on the deck. All in all it is a great experience. Thoroughly recommend it. Until last summer I hadn’t been to Amsterdam for simply yonks. Although I didn’t eat at any of the establishments listed here – and it is a pity that I didn’t – I was quite amazed at how much Amsterdam’s culinary scene had improved. The last time I visited was in the last millennium but things on the foodie front have improved vastly since then. This is just my kind of post, I am very much foodie and love to read anything which is having food in it. Now I am gonna visit Amsterdam to eat in all the above listed places. 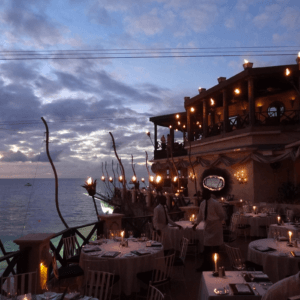 Aside from having a sumptuous dinner and an amusing cruise in the Stromma Dinner Cruise, there is also an informative sharing of historical facts by the crew to complete your fine dining experience. I did not even noticed that it’s already been two hours since we started the cruise because I enjoyed every moment of it. I haven’t tried the other restaurants yet but I hope I can find time to dine during my next visit to Amsterdam. One of our top fine-dining experiences in Amsterdam was Moon. A 19th floor revolving restaurant on top of the A’DAM tower with breathtaking views and wonderful fine food. Andrew, thank you for your comment. In preparing this article, we had to determine venues to write about based upon various factors. That included our own internet research prior to the trip. Then upon arrival, we would talk to taxi drivers, concierge services and locals. Another challenge in articles of this type is getting to the venue, so the final point of initial selection was easy to get to from our lodging. With only 5 restaurants featured, it is difficult to take into account all the other operations in Amsterdam that are also stellar in this rising culinary scene. Hopefully, we can cover Moon in a return engagement.